Fome board is your basic "foam core board" that is used for applications such as presentations, school projects, poster mounting and more. 3/16" thick available in White or Black. Gator board is a presentation board that is especially resistant to dents and punctures. It features hard Luxcell surfaces surrounding a lightweight polystyrene foam core. Ideal for photo mounters, artists, designers, sign painters, exhibit builders and engineers that need a durable board that will last being handled often and be more stable. 3/16" or 1/2" thick available in White or Black. 14-Ply White Posterboard is a professional quality, heavy-duty posterboard add an easel back and you have an eye catching counter display. 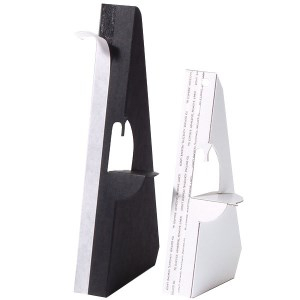 Easel backs - Create an instant display for signs, photos and presentations. No glue needed - Adhesive sticks to coated and uncoated paper. Double wing provides extra-firm support. Sturdy chipboard construction. Use with our Foam Core Board or Chipboard Pads. Laminating are most commonly sold in thicknesses of 3, 5, and 10 mils. The 3 mil pouches are the thinnest, and can be folded easily. 5 mil pouches are slightly thicker, but are still easy to score or fold. 10 mil Heavy weight coverage that provides maximum rigidity and maximum protection. Great for menus, luggage tags, ID cards and items that are handled on a regular basis.